For a person going out to eat, placing a reservation at a restaurant comes with a fairly simple set of expectations. The reservation is made for a particular time, and when the prospective diner turns up at the restaurant at that time, she expects to get a table and dinner. Whilst in today's connected and on-demand digital world, the customer has an increasing choice in the ways they can make reservations - phone calls, through the restaurant owns website, reservation platforms etc etc, the basic idea of a restaurant reservation remains the same. For the customer, aside from some small differences in the user experience, (and maybe some incentives) it doesn't make too much difference how the booking is made, the end result and expectation is the largely similar. For restaurant operators however, reservations are not so simple. Whilst the idea of reservations has always meant they are free for the customer, this is not the case for the restaurant itself. The way a reservation is made can have a direct impact on margins, effect staffing levels and/or productivity, and alter the likelihood that customer will be retained and become a loyal guest. Because of this, having a sophisticated understanding of how the new restaurant reservations landscape impacts operations, marketing and especially margins, is a key piece in the restaurant revenue puzzle. 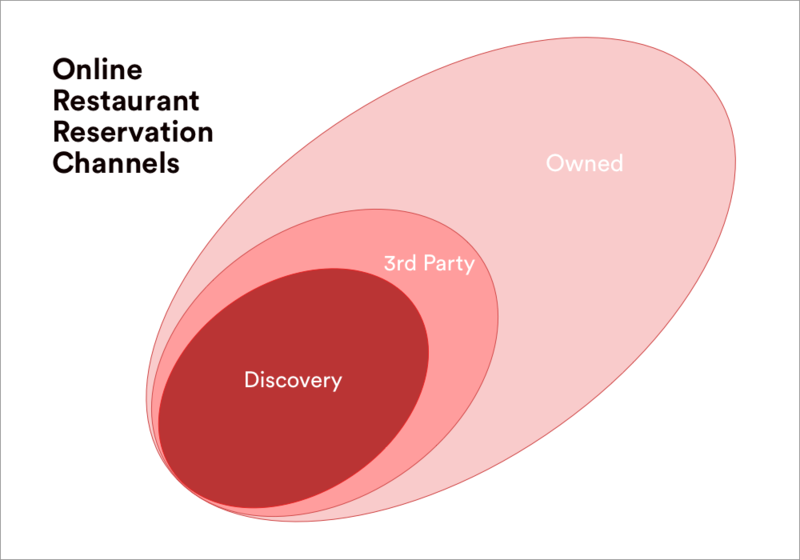 To get a clearer pictures of how reservations effect a restaurant it's useful to think of them in terms of 'channels'. A channel is a term used in digital marketing circles to describe the different ways a company has available to reach current and potential customers. 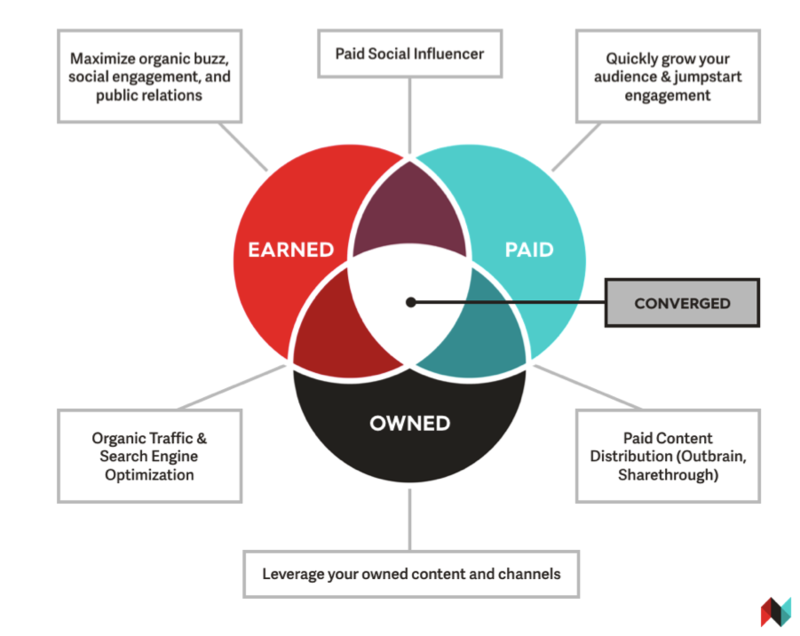 At a high level marketers often talk about channels in terms of "owned, earned and paid channels." You can see what this looks like in the image below. Within the owned, earned and paid channels there yet more channels and tactics to reach your customers. So for instance, in the paid channel a company could used many different types of advertising to reach their potential customers. Why think about reservations like channels? Channels are a useful concept because each channel has it's own benefits and weaknesses that will impact a business in different ways. As the chart above shows, channels intersect or converge, into an overall strategy. Restaurant reservations work like this also. Thinking about reservations in terms of channels helps restaurant operators assess the relative merits, (and drawbacks) of each reservation method, identify issues, and develop a reservation strategy with the aim of not just increasing bookings, but also improving loyalty and reducing waste. Currently a phone call is still the most common way to place a reservation. In the US for instance, the most developed market for online reservations, 2/3rds of reservations are made over the phone. But this is changing fast with a recent surveys suggesting 30% of diners more likely to use technology than two years ago. As the number places to make reservations online increases this is a trend likely to continue. Like marketing channels, online reservations are also split into three distinct channels. Reservations made through the restaurant website, and in some cases social media accounts and Google Business profiles. Reservations made through dedicated online restaurant booking platforms. Reservations made through APIs or widget's on large search and discovery platforms like Google search, social media platforms and discovery platforms like TripAdvsisor. These three channels make up the online reservations mix. We'll now look a little more closely at each reservation channel. Owned, sometimes also called direct reservations, are reservations placed directly through a booking widget on your website. The widget shows real-time table inventory and connects directly to your reservation and table management system, providing guests with instant confirmation usually via SMS and/or Email. Current reservation systems also mange your contacts so when a guest makes a booking their contact information and preferences are logged into your restaurant CRM automatically. For restaurants this is typically the best way to receive reservations as they are in full control of the reservation experience - from branding, to seamless check-out and customized communication. Owned reservations are also the best in terms of margins and efficiency. They reduce the amount of time staff spend on the phone, the booking is either free (or comes with a small(er) commission fee depending on region and provider) and you get full access to the guest details, which empowers you to convert that first time diner into a loyal guest. For these reasons restaurant operators will usually prioritize owned bookings. Choose bookings widgets that are easy to install and that are well designed and simple to use. Optimally, widgets should be fast loading, allow you to insert tracking tags and collect diner preferences and special requests. 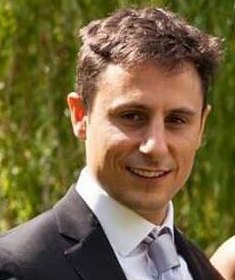 Seek out software providers that don't charge commissions on bookings through your website. Make it as easy as possible to make bookings through your website, and optimize your website your Google searches. Update your Google Business and social media profiles with your widget links. Calculate the amount of revenue gained from reduced commissions and increased loyalty if customers book directly instead of through 3rd part services. Develop a loyalty strategy. As website reservations capture guest data, the smart strategy is to capitalize on this by using marketing and improved guest experiences to bring them back again and again. Promote behavior change, through in-house communication and on social media, to encourage your customers to book through your website. Reservations made through dedicated online restaurant booking platforms such as OpenTable, are diner networks that charge a commission per cover booked through the platform. 3rd party platforms typically operate on a city or country level so restaurants will only be able to partner with a limited number of these services depending on location. impact on incremental reservations for a restaurant, but of course this comes with a cost in the form of commissions. Costs between platforms and markets vary greatly, so it's usually about deciding on a acceptable number of 3rd party reservations per month on a restaurant-by-restaurant basis. If you have a half-full restaurant most of the time, partnering with a platform can fill that hole. Beyond paying commissions 3rd party platforms have one other difference compared to owned reservations. As the reservation is made on the site of the platform, the platform captures the customer data, before forwarding it to the restaurant. This may have consequences for restaurants in terms of customer retention and loyalty as the platform owns the customer communication channel rather than the restaurant. At present there is very little good data about the true impact of this on restaurant's bottom line. If your number one strategy is to improve customer retention then reservations from 3rd party platforms may slow your retention rate. On the flip-side, removing your restaurant from 3rd party platforms in an effort to improve loyalty and lower commission rates for repeat visits may drop your overall revenue as the people who rely on booking platforms are suddenly unable to find you. Optimize your profile on the platform with high quality photos and up to date information. Reviews tend to make or break your success on 3rd party platforms so encourage your guests to leave positive reviews. Define a balance between owned and 3rd party reservations taking into account money spent in commissions, new customers gained and the impact on loyalty. Search and social media platforms are some of the web's largest companies. They include Google Search, Facebook, Instagram, TripAdvisor and many others. Whilst relatively new as source of reservations, they are fast becoming an essential part of the reservation mix because of the huge amount of targeted traffic they are capable of driving. For example, if you've spent a lot time building a large and loyal social media following on Instagram, you get a lot of Google searches every month for your restaurant and maintain an optimized Google Business page or you operate in a tourist location and get lots of traffic from TripAdvisor, this new trend in reservations - where customers can book directly from these discovery platforms is likley the next big shift in customer behavior for your restaurant. Companies like Google and Facebook are always looking for ways to provide value to businesses, (as well as keep people on their platforms). One way of doing this is giving businesses the ability to accept transactions, such as booking a table, directly from the business profile. In practice this usually looks like a large Call-to-Action button on your Instagram or Google Business account that makes it easy for a potential customer to check-out. 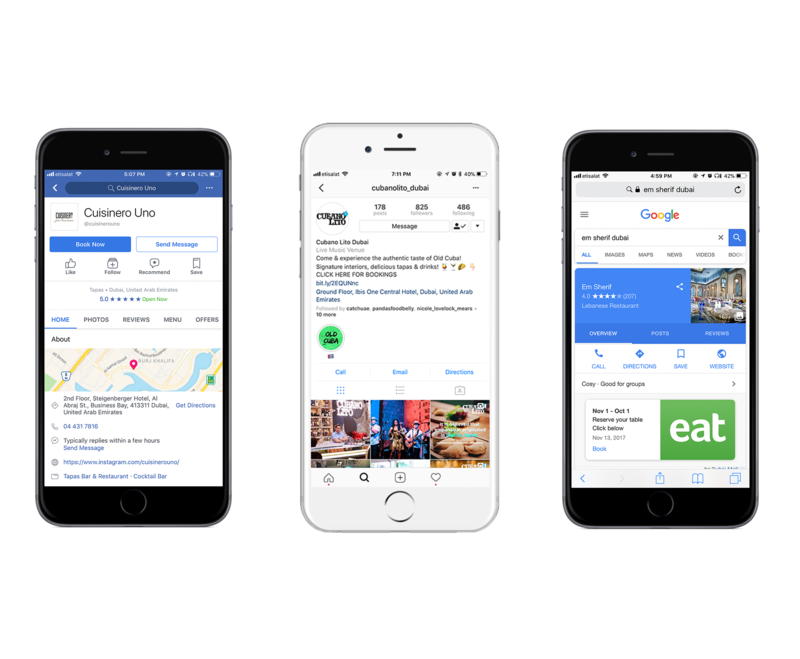 Whilst these services are huge traffic drivers for businesses, including restaurants, it's important to realize that due to their size and reach they won't work with individual restaurants when it comes to adding booking functionality. Instead, they partner with market specific restaurant tech providers, ie. 3rd party booking platforms and reservation system companies, that can automate the process and provide the platform with 1000's of restaurants upfront. This means to gain access to traffic, and also the potential customers, restaurants need to be partnered with a 3rd party booking platform, or reservation system that is partnered with relevant platforms for their market. Seek out restaurant reservation tech that provide access to these platforms. Understanding your market and which services are relevant to you locally is the key to maximizing this channel. There's a lot of hype around the Instagram booking feature for example, but if you have 100 followers and 10 pictures in your account then this partnership is unlikely to benefit you. Optimize your profiles on sites where you have integration. Depending on location and service you can optimize your Google Business page for example or work on boosting your Instagram account. 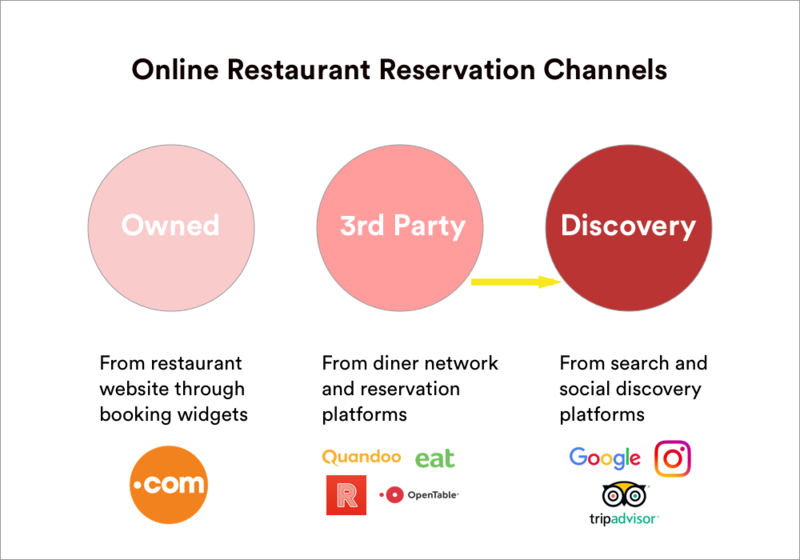 In the new digital world there are now three main reservation channels for restaurants - Owned, 3rd Party Reservation Platforms and Discovery networks. However, unlike phone bookings, each of these digital channels has it's own set of considerations, costs and impact on a restaurant's operations and margins. Navigating and succeeding in this digital reservation landscape is about finding a balance between owning the customer experience and getting as much new business a possible. Owned reservations are great for restaurants as they work most like phone calls and you benefit from getting the customer data directly into your CRM, which has a huge impact on loyalty. But for most restaurants relying only on your website to generate new business severely limits your visibility online, and cuts off access to customers who habitually use 3rd party bookings platforms to book tables. The newest channel, search and social media websites, make is easy for customers to book with you by bypassing your website and 3rd party booking platforms altogether and are likely to be the biggest driver of growth in the online reservation market for the foreseeable future. Smart restaurateurs are proactively choosing restaurant technology that meets their unique needs and has a positive impact on their business. How are you finding that balance?